MHA requirements vary based on housing costs in each area of the city and the scale of the zoning change. Higher MHA requirements apply in areas with higher housing costs and larger zoning changes. With the performance option, between 5 percent and 11 percent of homes in new multifamily residential buildings are reserved for low-income households. With the payment option, development will contribute between $5.00 and $32.75 per square foot. Fees will “support affordable housing” in Seattle, the city says. Steve Walker, with the Office of Housing, said the city and nonprofits face a “long pipeline” for the building process, but it takes no longer than the typical developer who chooses to pay into the fund than actually include affordable housing in their buildings. She said housing and social justice advocates have long called for more inclusionary housing. Burgess said the goal is to build 50,000 new housing units in next decade with 20,000 units of affordable housing either preserved or created. Those who qualify for affordable housing include someone making less than $40,320 a year, paying no more than $1,008 for a one bedroom, or a family of four making less than $57,000 a year, paying no more than $1,296 for a two bedroom. MHA is hoped to drive creation of about 12% of the housing the city says is needed. Those who qualify for affordable housing include someone making less than $40,320 a year, paying no more than $1,008 for a one bedroom, or a family of four making less than $57,000 a year, paying no more than $1,296 for a two bedroom. A displacement risk assessment was conducted on the urban villages. Those at a high risk of displacement and low access to opportunity included Bitter Lake Village, Othello, Rainier Beach, South Park and Westwood-Highland Park. Broadway’s proposed zoning changes won’t matter for the largest development project underway on the core Capitol Hill artery. The development of four mixed-use buildings set to surround Capitol Hill Station was guided under a separate community process from the Housing Affordability and Livability Agenda and will create more than 400 affordable and market-rate apartment units and 59,000 square feet of commercial and community space with some of the land upzoned to 85-foot limits. Meanwhile, the new MHA proposal gerrymanders an upzone for the parcels where two new mixed-use buildings are planned to rise where Bonney Watson stands today. Developers for that project told CHS they were not planning for their project to utilize any potential MHA upzone. The setting of the mayor’s citywide MHA announcement, meanwhile, in what could be the last of its kind Broadway Hill Park in the dense blocks of Capitol Hill just above Broadway is likely part of the message. Broadway Hill officially opened in July 2016. Seattle Parks acquired the land at the corner for Federal and Republican in 2010 for $2 million after a townhome project slated for the property fell through. Concerns about crowding and loss of open space are just part of the pushback officials have faced from neighborhood groups aligned against the HALA process. Thursday’s milestone for the MHA process pivots around the state-required Environmental Impact Study for the proposal. We’ll also know more about how the plan will handle uniquely Capitol Hill elements like the Pike/Pine Conservation District which has allowed developers to build seven stories instead of six for preserving an old building facade in Pike/Pine. The release of the plan will kick off another round of public feedback and also, potentially, litigation to stop or reshape it. UPDATE: You can view the complete EIS documents here. Today Mayor Tim Burgess and Councilmember Rob Johnson proposed a plan to implement Mandatory Housing Affordability (MHA) requirements on new development across Seattle that will meet the City’s goal of at least 6,000 new rent-restricted homes for low-income people over the next decade. The Council has already unanimously implemented affordable housing requirements on new development in six neighborhoods (University District, Downtown, South Lake Union, Chinatown-International District, along 23rd Ave in the Central Area, and Uptown). By extending MHA to Seattle’s other urban villages, as well as all other existing multifamily residential and commercial zones, new development will generate the rent- and income-restricted homes to meet the City’s 10-year goal. Seattle continues to experience some of the fastest housing cost increases in the nation, with the average rent for a one-bedroom apartment rising 35 percent in the last five years. Today 45,000 Seattle households spend more than half of their income on housing. Under MHA, the cost of a rent-restricted two-bedroom apartment for a family of four earning $57,600 would be $1,296. For an individual making less than $40,320, a one-bedroom would cost $1,008. The City is proposing zoning changes necessary to implement MHA in all urban villages and multifamily and commercial zones. The affordable housing requirements take effect when the Seattle City Council adopts new zoning that adds development capacity. By enacting affordable housing requirements and development capacity increases at the same time, MHA is consistent with a state-approved approach used in other Washington cities. · Increase housing choices throughout Seattle, with more housing in areas with low risk of displacement and high access to opportunity (transit, parks, jobs, and other critical resources). · In areas with high risk of displacement of low-income people and communities of color, focus increased housing choices and jobs within a 5-minute walk of frequent transit. · Expand 10 urban villages to provide more housing options within a 10-minute walk of frequent transit. · Minimize growth in environmentally sensitive areas and propose less intensive changes within 500 feet of major freeways. · Make no zoning changes in federally designated historic districts and critical shorelines. Maps of the proposed zoning changes are available at www.seattle.gov/hala. 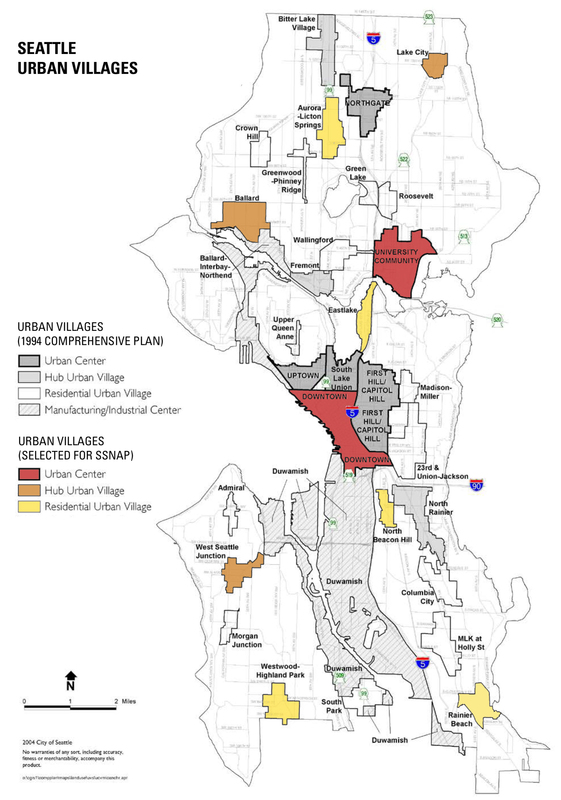 No zoning changes are proposed for single family zones outside Seattle’s urban villages and urban village expansion areas. Since 2015, Seattle’s Office of Housing, Department of Neighborhoods and Office of Planning and Community Development and have worked with community members on the implementation of MHA citywide. A community input summary catalogs the feedback the City has received through nearly 200 community meetings, 20 open houses, telephone townhalls, door belling, and online engagement. In 2018, the City Council will continue to engage communities as it considers MHA implementation citywide. The Council intends to hold a slate of open houses and hearings across the city through August 2018 so that more community voices can continue to shape the proposal. The forthcoming City Council public process schedule for Citywide MHA is at http://www.seattle.gov/hala/calendar. With MHA, new buildings must include affordable housing (performance option) or contribute to the Seattle Office of Housing fund to support the development of affordable housing (payment option). MHA requirements vary based on housing costs in each area of the city and the scale of the zoning change, with higher MHA requirements in areas with higher housing costs and larger zoning changes. With the performance option, between 5 percent and 11 percent of homes in new multifamily residential buildings are reserved for low-income households. With the payment option, development will contribute between $5.00 and $32.75 per square foot. · Allowing more people to live near parks, schools, and transit. · Incorporating new design standards for buildings to reduce impacts on neighborhood character. · Improving Green Factor and tree requirements for new development to support the City’s longstanding environmental goals. MHA is part of Seattle’s Housing Affordability and Livability Agenda that strives to create 50,000 homes by 2025, including 20,000 affordable homes. The development of both affordable housing and market-rate housing is an important strategy for slowing housing cost increases and providing a wider range of housing choices. This entry was posted in News, etc. and tagged affordability, broadway, broadway hill park, development, hala, mha, miller park by jseattle. Bookmark the permalink. Am I the only one that has difficulty reading the legend? the colors (especially beige tones) are very similar and when the black striping is added, hard to differentiate. Would anyone be willing to offer tips on how to best figure out what is planned for a specific area? Thanks Jseattle. Some of the projected maps seem to offer more info than others, and I feel like I need a legend for the legend. I’ll keep digging but at present can’t find descriptions of LR1, LR2, etc. Just one minor nit to pick. The proposed changes unveiled today apply only inside 22 gerrymandered Urban Village islands scattered throughout the city. If or when these changes are voted into law, MHA still won’t apply to the 70-75% of residential areas in Seattle outside the Urban Villages. That is by design. Guess where all those affordable units will be? That’s right, not in the SFH zoned areas (also known as the richest areas in town generally). The wealthier areas do not want subsidized housing in their neighborhoods, and this is a backhanded way to prevent it without outright opposing it. My street has already paid it’s dues…. several time over. We started out with smaller than average lots way back in the early 1900’s (mine is 2,100 sq ft), we were up zoned once already in the late 1990’s and now we are being picked on once again. Enough already – go after someone else’s neighborhood please. On the one hand, it’s disappointing how little this actually does to add more housing to the city. Why keep the vast majority of our city frozen in single family houses on 5,000 square feet lots? Why keep zoning like low rise (town homes) within blocks of light rail stations? On the other hand, we shouldn’t wait any longer to require affordability. In hindsight, Mike O’Brien is seeming mighty prescient with his idea to add an affordability fee years ago to try and capture the construction boom while HALA was being worked out – I wonder how much of that we have missed now. Lowrise includes apartment buildings up to I believe 4 stories. The “vast majority” is not in single family housing. That’s a lie that has been refuted over and over. In addition, the current zoning has plenty of capacity for more housing, and it’s being built. The map is easier to interpret if you zoom in enough: the different zoning designations are called out in print. I think that the added affordable units under this plan will have a minimal impact on Capitol Hill because 1) only 5-11% of them (if any at all) in a new building; and 2) developers will probably choose to pay the fee most of the time instead of providing affordable units. This plan is mainly a boon to benefit rapacious developers, of which there are many now in our city. Bob, when the in lieu fee is paid, it actually gets to be combined with other dollars and used by non-profit housing developers like Capitol Hill Housing. In lieu fees are a good thing. Yes, I understand that. But the accumulated fees are most likely to be spent for housing in less expensive areas, which means there will be no benefit as far as affordable housing on Capitol Hill. Exactly – this is city advocated neighborhood destruction that stuffs more and more high value properties into places that are already expensive, displacing some people and pressuring the remaining ones to sell out… Seattle is betraying it’s neighborhoods and it’s history to developers who don’t live here and don’t care at all about anything but their profits. @ CD neighbor…..you’re right. There is a “feeding frenzy” going on by rapacious developers. Homeowners of modest, older homes (like myself) are being offered ridiculous amounts of money for their small properties (so that their home can be demolished for ugly boxes). I’m not selling, but I can understand why many people are taking the bait. Here’s an article in Crosscut covering MHA. The comments are full of info as well.